Is Hip Hop welcome in Wine Country? Alexandro "Guapely" Lopez channels his experiences in Santa Rosa into his music. Alexandro Lopez was attending elementary school in 2009 when his father introduced him to the music of the late rapper Tupac Shakur. 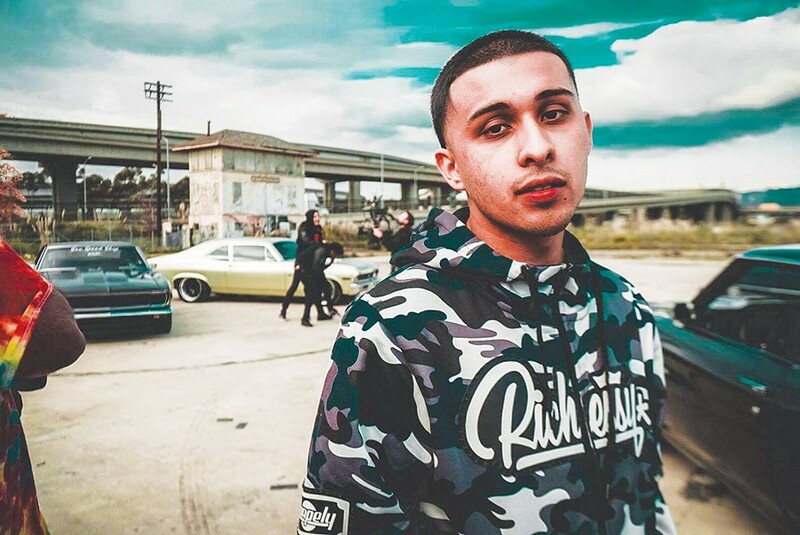 Lopez was immediately drawn to Shakur and now the 21-year-old Santa Rosa native is a hip-hop artist himself who goes by Guapely. "English was always my strong suit in school" says Lopez, who graduated from a Santa Rosa High School. "I was into poetry before I started rapping." Guapely is part of a vibrant and Latino cultural scene that's grounded in southwest Santa Rosa. After the 2017 wildfires it's easy to notice the volume of people leaving for more affordable housing or better jobs (some 7,000 people are estimated to have the county after the fires), but what's not so easy to see are the people who have chosen to stay—or who have no choice but to stay. Guapely has put down roots in a county that's not generally considered a beacon of upward mobility or a hub of cultural diversity. He channels the experiences of the 24 percent of Sonoma County who identify as Latino, and anyone else who might enjoy hip-hop music. But is Wine Country ready to enjoy Guapley's brand of hip-hop? "It's a challenge to reach the market I want to reach," says Lopez. "Sonoma County is very strict about working with hip-hop artists who want to reach out to local schools. I feel like the city is fearful that hip-hop will bring a negative image to the community. But when you look at the artists in Santa Rosa, a lot of the rappers are speaking about positivity." As a student, Lopez turned poetry into his first rap song, which he recorded on a flip-phone. His stepfather was impressed and bought some recording equipment for Lopez, who used the new gear to release his debut CD in 2012 while he was still a student. "I started selling my music in middle school, and sold more at Elsie Allen in Santa Rosa. I made back all the money I spent on my CDs. That was a good feeling, and that's when I started investing in myself with flyers and an in-home studio." Lopez says he reached out to the Santa Rosa City Schools district with the hopes of speaking to and performing for students, something he says he's done for school's in Fresno, Los Angeles and Richmond. The homegrown rapper says he was given the runaround by the city and the school district. "The city kept sending me to the school district, and every time I reached out to them, they never responded back. I would walk into local schools and speak to the principals, who would send me over to the district," he says. This bureaucratic back-and-forth led Lopez to believe that hip-hop artists are viewed negatively in Sonoma County—and says it's a factor that explains why local artists leave for greener pastures. "I even see artists moving to Vallejo because they feel so limited in what they can accomplish here. It gives artists a helpless feeling when their community doesn't back them," he says. "Sonoma County is one of the hardest communities to realize your dreams." The school district says it has no record of conversations with Lopez about performing. "We have no information that any of our schools have told Alexandro Lopez anything about performing," says district spokesperson Beth Berk. "If he had applied to use our school facilities, we would have that record at the district. We can tell you that Latino families are valued members of our school community, and Latino culture is embraced in countless ways in our schools." The sentiment is echoed by the city, which adds that it has been supportive of hip-hop events. "The city of Santa Rosa welcomes opportunities that bring diversity in arts and culture to our community," says spokeswoman Adriane Mertens, "and through programs funded by the Santa Rosa Tourism Business Improvement Area, has consistently provided support to events and programs that include hip-hop artists, along with a range of other musical genres and art forms." But Guapely still feels shut out. He recently organized a free art show in southwest Santa Rosa, in part to counteract what he sees as the negative perception of the hip-hop scene. The rapper is planning more community events, as he invests his own money to create a space for artists to be seen and heard. "Having a strong art and music culture will provide a financial boost for the city and even the wine industry because it will attract people who normally wouldn't come here," Lopez says. He'd like to see the community create an easier path for local artists to express themselves by providing increased venue spaces at affordable rental rates. "People ask me all the time what's there to do [in Sonoma County] and all I can say is 'go winetasting.' I want to help change that," he says. "I'm trying to build that here; that's why I'm still here. [But] when I reach out to certain venues in Sonoma County, they shy away from it. They just say 'we don't do hip-hop events,'" he says. Lopez says he thought he found a venue willing to work with him on a hip-hop festival he organized to take place at Santa Rosa's House Of Rock. He says he invested his own money in securing a DJ and sound engineer, and says he booked the artists for the event only to be forced to cancel. "At first, they were cool with it," he says. "Then, all of the sudden the venue refunded my deposit and told me that it was going be too much of a headache and didn't want to deal with it." Lopez believes pressure from the city forced the venue to change its mind about hosting the event, but offered no evidence. Evan Alexander, general manager at the House of Rock, says the venue has never been pressured by the city over hip-hop acts, and that it's called the House of Rock for a reason. He said Guapely's crew wasn't entirely up front about the show they were hoping to book there. The venue does not book hip-hop acts as a matter of policy, Alexander says. "We made our decision as a venue not to get into the hip-hop world because of issues we've seen in other places," he says, adding that "we never took any money for a hip-hop show and then canceled." Guapely's holding his ground. "Of course they would try and make it seem like it never happened and not look bad. We went there because the venue was really nice and we wanted to perform there. There was no secret about what we were trying to do. And just because it's called House of Rock doesn't mean they only have rock events." The city says it never intervened to get the proposed hip hop-show canceled. "House of Rock was issued a conditional use permit by the city of Santa Rosa for operation of an 'entertainment assembly venue' and music genre was not discussed during the permit approvals process," says Mertens in a written statement. "Because the venue operator is the holder of an approved conditional use permit, additional city approvals are not needed to book individual events and performances, and city staff are not involved in those processes." Danny Chaparro is Roseland's first Community Advisory Board appointee and the man behind the Street Soldier clothing brand. He's focused on helping local youth find a passion, establish a goal and connect with locals who can serve as viable role models. "The Street Soldier brand kept me community-based," he says. "Kreative Living allows me to bring out the artistic outlet in the community's talent." The Roseland-based renaissance man wants to be part of a region that's known for more than catastrophic wildfires and world-class wines. "People think big city, big dreams," he says. "They never think it could be small city, big dreams. I want to show people there are resources here that make the big dreams possible. You don't need to be in big cities anymore. All you need is social media." Chaparro's pushing local youth to embrace active roles in shaping the community, to avoid feeling trapped and limited in their environment. The Community Advisory Board and the city of Santa Rosa are working on strategies to motivate local, disengaged youth, who often place little value on their own self-worth. "Younger people who move away to bigger cities are a little more privileged to afford to start over in those places," he says. "People don't realize how to find the right resources in their own city to accomplish what they want." This summer, the Community Advisory Board will start a series of "neighborhood fests," featuring community-based block parties. Chaparro hopes these events can show local youth that instead of leaving to making moves elsewhere, they can stay in Santa Rosa and succeed here. For a county in the midst of a massive rebuild, he says, the presence of an actively-engaged core of locals willing to help repair the foundation of the region is at a premium. "It goes back to why I started Street Soldier," he says. "To really be the change." Do Latino artists like Guapely face an uphill battle in Santa Rosa? "I could see how a school wouldn't want to take the blame for a kid going home and telling a parent about a hip-hop event," Chaparro says, "and the parent asking: 'Why they are letting the kids listen to that?' I think it's more real and authentic for schools to allow a local performer to come in and tell their story. We take the time to tell the kids what not to do, but we don't take the time to understand why they are doing what they are doing." If schools are not allowing hip-hop events it's because they are about protecting, instead of about understanding, he says. "We need to understand where they are coming from instead of where the kids are going. In order for this community to be more united, we need to involve the youth." The problem isn't the Latino kids or hip-hop artists like Guapely, he says—it's the perception that they deal with in Wine Country. "This county has a big problem with truancies and it isn't because these kids are out there gangbanging or anything like that. It's that they just aren't motivated because they have no one that looks like them, that came from where they did, providing inspiration for a different way."